A survivor of the USS Indianapolis recounts his harrowing ordeal at sea and his thoughts on the discovery of his long-lost ship. On July 30, 1945, just days before Japan’s surrender that ended World War II, a Japanese sub sunk the USS Indianapolis with two torpedoes. The Indy was lost for 72 years until Microsoft co-founder Paul Allen discovered the wreckage on Aug. 18, 2017, at a depth of 18,000 feet. The following interview with one of the last remaining survivors — Marine Corporal Edgar Harrell — gives a chilling account of the disaster, explains how the Lord brought him through the trial, and reveals his feelings about the discovery of his ship. 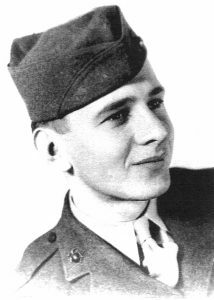 Marine Corporal Edgar Harrell at age 20. Q: Has the discovery of the USS Indianapolis brought you a sense of closure? A: I don’t know that it brings closure necessarily, but it is wonderful be a survivor. Now it’s a little different for those who know that their loved one was lost at sea. But I think even they, like all of us, have wondered now for these 72 years where the Indianapolis sank and what condition it’s in. Now we know that the ship is all broken up. I have said through the years that when they find it, they’re going to find that it’s broken up because the bow was broken off and the ship went down fast. Q: Of the 1,196-man crew, how many are still alive? A: There are only 18 of us still living today [17 sailors and one Marine]. We have been meeting every year and rehashing what we experienced, but hoping and praying every year that somehow, someway, someone would find the ship. I’m the only Marine left. And I’m the only survivor to have written a book: Out of the Depths. The phone hasn’t stopped ringing since the news came out that they found the Indianapolis. Q: How did you escape after the Indianapolis was hit by torpedoes? A: When the ship was hit by the first torpedo, I was up under the barrels of number 1 turret, and I knew that the bow [the front of the ship] was cut off. It dropped down, and I could hear all the water coming in down below. And then the second torpedo hit back close to the Marine compartment and the magazine blew up. There were many other fires and explosions below deck, and I knew immediately that the ship was doomed because I could see that the bow was dropping and the screws [the ship’s propellers] were pushing the ship forward and all of that water coming was coming in the open bow. It was flooding the first 100 yards nearly immediately, and I knew that I had to make my way back to midship to my emergency station. 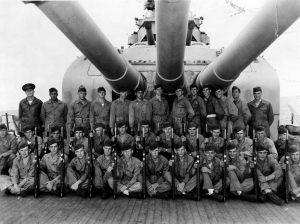 The Marine detachment posing below one of the turrets on the USS Indianapolis. When I was leaving the ship, I knew it was sinking because normally the quarterdeck would be eight feet above the waterline, but water was on the quarterdeck and word finally trickled down like an echo to abandon ship, and everyone then on the quarterdeck rushed to the high side — the starboard side. I went over and hung onto that rail, looked out into the blackness of the night, looked at all of that oil on the water, and had my kapok jacket [lifejacket] on. As I ran that through my mind, I knew that the Lord was not speaking audibly, but I knew…I knew beyond any shadow of doubt that I was going to make it. I didn’t know I was going to be out there four-and-a-half days. I didn’t know that I was going to be swimming with the sharks and seeing my buddies disemboweled or the bottom of their torsos gone, or that by the third day at noon that group of 80 men would only be 17. We had no water; it was 110 degrees; we had sores on our lips, and they were parched open because of all the salt water and the black oil in it. And because of dehydration, our tongues were swelling in our mouths. And we wondered if we would make it any longer, and then after a while another buddy was gone. But I never gave up. I never failed to say “Thank you, Lord.” I knew that I wouldn’t still be alive if He weren’t with me, and He would remind me every little bit when I would hear a bloodcurdling scream and look and see that kapok jacket of a buddy out at 50 to 75 yards go under and spin, spin, spin. And we dared not to go out there because of the sharks, but later we checked to see who that buddy might have been and we found that the bottom torso was gone or he was disemboweled. 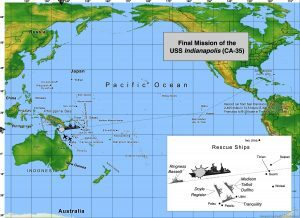 The final mission of the USS Indianapolis. Q: How did your faith help you through life after your rescue? A: It challenged me when I got out. Through the years the Lord has taken me back to all that happened. It’s a constant reminder and it has challenged my Christian life all these years. Even today I look up and thank the Lord. It is definitely the Lord’s mercy and grace that has been with me through these years. 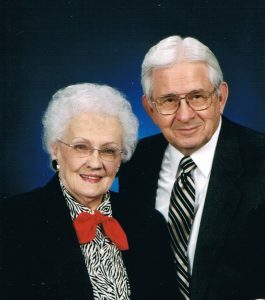 Edgar Harrell, and his wife, Ola, have been happily married for 70 years. And that brunette who said she would wait for me when I went in the Marine Corps… we were married after I came home in 1947, July the 25th. We just celebrated our 70th wedding anniversary. She is 91 and we look at our life as a constant remembrance of God’s mercy and His grace and the Christian life that we strive to live for Him. And to prove that, I look at my son. I only have a son. 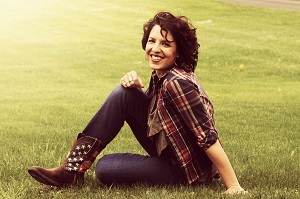 I had a daughter who died of breast cancer, but my son is my pastor and I tell anyone who talks to me, if you want to hear someone who is a theologian and a teacher, go to Calvary Bible Church Tennessee, and you’ll see my son, David Harrell, and you’ll see someone who is heard all over the country and in many, many foreign countries too. Q: Do you think our national and international conflicts are a symptom of a deeper spiritual problem? A: When I look at international problems, I just have to say, Lord, You are in charge and You promise that one day You are coming back. And I think of II Thessalonians, where it says that the wicked one will appear. Our world is ready for the antichrist and he will feel at home when he comes, but the Lord will ultimately destroy him. I am looking for the coming of the Lord Jesus to take the church, and I am confident in that, but then I am confident that there are the many, many things that will transpire in this world before He comes in power and glory at the Second Coming, when He comes back to establish His millennial kingdom. And so, yes, I look at that and say, Lord I am coming home whenever you give me the call, and I am ready to come, but I’m satisfied to continue to live with Your mercy and grace until You come for me. Q: What would you tell this generation to avoid the mistakes of the past? A: I often have opportunities to share the Lord. I had such a case not long ago. A man came to see me and I had an opportunity to tell him that the only hope for him and for so many in our world today who are living just for themselves is that there is only one way of salvation and that is the salvation that the Lord Jesus paid 2,000 years ago when He went to the cross of Calvary for our justification. My wife and I often have the opportunity to share this, but it is difficult sometimes because most people don’t want to hear it. But with some there comes a time when they ask questions and they are seeking, and so we have the opportunity to invite them to the Lord. Edgar Harrell, USMC (Ret. ), owned and operated a distributorship for the Pella Window Company in Rock Island, Illinois, for 35 years, served for 15 years on the board of the Moody Bible Institute, and has been a lay minister throughout his adult life. He lives in Clarksville, Tennessee, with his wife, Ola, enjoying their two children, eight grandchildren, and eight great-grandchildren. Edgar speaks extensively around the United States about his survival at sea. David Harrell is currently the senior pastor-teacher of Calvary Bible Church (www.cbctn.org), where he has served since 1997. His Bible expositions are heard and read regularly around the world over the Internet and broadcasted over the radio. He is married to Nancy, and together they have three children and six grandchildren.